Born Krapanj, Croatia, 17th September 1938. Passed away 8th April 2019. Loved and loving Husband of Valerie. Loving Dad of Darren, Greg and Sascha and Grandad of 8. Srce Moje, I will be lost without you. You were my rock, always there for me. I will miss you every second of every day. The Funeral Service for Mr Frane (Frank) Curovic of Baldivis will be held in our Chapel, 312 South Street, Hilton, commencing at 9:45am, WEDNESDAY (17.04.2019). The cortege will leave the Chapel after some light refreshments and arrive at the main entrance of FREMANTLE Cemetery, Carrington St, Palmyra at 11:45am for a Burial Service. Our sincere sympathy to Valerie and Family on the sudden passing of Uncle Frank. Our thoughts and prayers are with you all. From Marija, Bozidar, Ante and Phoebe. Rest in Peace. 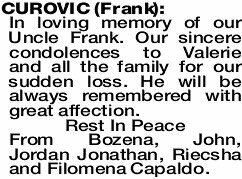 CUROVIC FRANK In loving memory of our Uncle Frank. Our sincere condolences to Valerie and all the family for our sudden loss. He will be always remembered with great affection. Rest In Peace From Bozena, John, Jordan Jonathan, Riecsha and Filomena Capaldo. 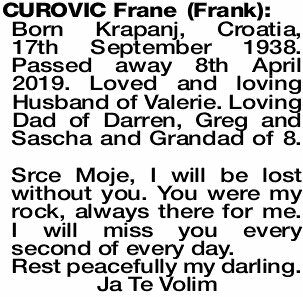 CUROVIC FRANE Treasured memories of our dear brother-in-law and uncle. Always in our hearts. God be with you til we meet again. Love and sympathy to Valerie and family. Love June, George (dec), Steve, Karen, Tim, Chris, Melinda and families. In loving memory of my friend and working mate. Our condolences to his wife Valerie and his children Darren, Greg and Sasha and their families. Rest in peace. Mirko Smokrovic and families.